An AudioFile Earphones Award winner for 47 Ronin by John Allyn, David Shih narrated the History Channel documentary China's First Emperor and the Discovery Networks series Royal Inquest. He is the voice of Eddie Toh in the hit video game Grand Theft Auto V. In addition to his role as Isiah on the Hulu original series The Path, he has appeared in the TV shows The Blacklist, Mozart in the Jungle, Unforgettable, Golden Boy, Blue Bloods, Are We There Yet?, Late Night with Conan O'Brien, Law & Order: Special Victims Unit, All My Children, and As the World Turns, as well as the feature films The Amazing Spider-Man 2, Respect the Jux, Old 37, Fan Girl, and Saving Face. 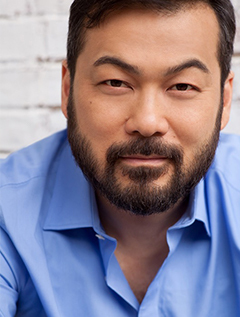 His theater credits include the National Asian American Theater Company's acclaimed production of Awake and Sing! at the Public Theater, The World of Extreme Happiness (Manhattan Theatre Club), Bike America (Ma-Yi Theater Company), and Crane Story (The Playwrights Realm). Dave also works with Only Make Believe performing interactive theater for children in hospitals and care facilities.